Take a look at the effects of prolonged emotional restraint in When the Ancestors Call. This play by Elizabeth Brown-Guillory follows a young doctor named Caroline as she finally faces years of repressed emotion and experience. Throughout the piece Caroline begins to make progress in her struggle with the past through the strength and wisdom of her ancestry, alive or dead. 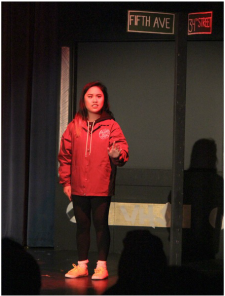 Written by Rainbow Theater alum Esteban Sunday, BOY offers a look into filipino-american life through the eyes of 16 year old Bayoa "Boy" Rosario De La Cruz and his experience with family, school, and religion. His interactions with characters like Carlo De La Cruz, and relative and friend, and Basilio "Boy" Reyes De La Cruz, a devout and hardworking father, highlight struggles with physical and mental abuse, and the often impossible expectations placed on students in today's society. Serene Tang, Ricardo Lopez and Nathan Lie in Boy. ​Patricia Zamorano's Locked Up focuses on three chicana/latina minors in Lakeside Juvenile Hall. Their backgrounds and the various actions that eventually land them in prison are explored and used to discuss larger-than-life issues such as gang violence and the impact of violence in the home within under-resourced communities. 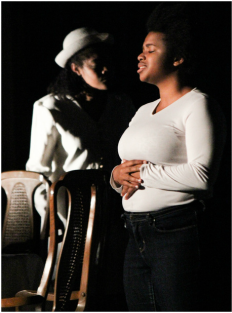 A fusion of acting, spoken work, and music, LOCKED UP grips you from start to finish. 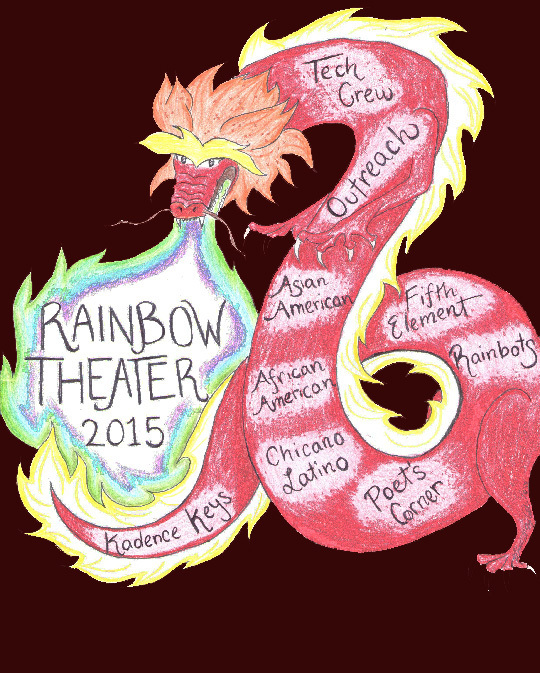 POET'S CORNER is a fully student-produced showcase of some of Rainbow Theater's premier spoken word poets. From prose, to slam poetry, to song and dance, Poets Corner encompasses the very essence of Rainbow Theater: empowerment and education through the use of unfiltered, unapologetic artistic expression. POETS! Samantha Conde and Georgina Rios in Locked Up. Raine Briones in Poet's Corner. A Record of Light is a powerful account of six souls searching for purpose in a world that all too often seems purposeless. Featuring the likes of Orelia Key, a woman who's used to living fast but must adapt as time passes and she realizes its finally time to take command of her life, or Alfredo Serrato, an ex-convict trying to find his place in a society that is quick to condemn him for his past while ignoring his present and future. Other characters include a singer who's lost her voice, a drag queen trapped in his own body, and other complex and poignant individuals. Through a combination of acting and live musical accompaniment by Rainbow Theater's brand new JAZZ BAND, Bliss' vibrant and moving play will be brought to life. Come and be cleansed as Rainbow Theater conducts this daring exploration of the mind, body, and soul. For the third year in a row Rainbow Theater's very own dance troupe, RAINBOTS, will grace the stage with dances spanning several different cultures as well as guest appearances from performers in other creative spaces. Jassi Samra in A Record of Light. Dancers in the Rainbotz Fall Show.